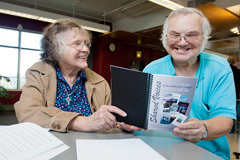 Gorge Literacy provides free tutoring services to adult learners within the Columbia Gorge, including: Wasco, Hood River, Gilliam, Sherman, Wheeler, Klickitat and Skamania counties. Tutors needed for: reading & writing, basic math, English conversation, citizenship, GED Preparation, life and work skills. Help support Gorge Literacy with a tax-deductible contribution.